Oman might not feature in many traditional food and wine guidebooks, but we have discovered some real gems in Muscat and the Capital Area as well as on top of Jebel Akhdar at 10,000 feet! We would like to share these special experiences with you and we will be delighted to put together some gourmet holidays just for you. We have listed our favourites and look forward to selecting the cuisine of your choice combined with some wonderful hotels to produce a food and wine lover’s magical experience. Eight restaurants at The Chedi Muscat span the great cuisines and wines of the world, from the Mediterranean and the Middle East to Southeast Asia and India. The award winning Beach Restaurant, The Restaurant and The Long Pool Cabana, simple names that belie sophisticated dining experiences. Stylishly designed by renowned Japanese interior designer, Yasuhiro Koichi of Design Studio SPIN, The Restaurant blends clean Asian interiors with Omani architectural details. Elegantly curved Omani arches make a dramatic first impression in this vaulted, crystal chandelier lit dining room with contemporary cool dark grey terrazzo floors, expansive bay windows on the gardens and live piano music. Four open show kitchens add entertainment and aromas as some of Muscat’s finest culinary talents prepare Western, Asian, Middle Eastern and Indian fare, paired with wines from their award winning list. Dine as well on the outdoor patio. Considered Muscat’s most romantic dining venue. Dine along the 370 metre private beach where the creative seafood menu is accompanied by a sublime Gulf of Oman panorama and paired with an equally impressive wine selection. Soak up the sea breeze and salt air on the expansive waterfront patio or gaze out from the high ceilinged, contemporary dining room. Freshly caught Omani lobster is a stand-out feature of the Beach Restaurant. Feast upon delicious Japanese and Malaysian cuisine after a serious swim in the 103 metre Long Pool, the longest in the Middle East. Or simply gaze upon its shimmering water and out to the Gulf of Oman whilst dining on exquisitely cut Japanese sushi and sashimi. Heat up your palate with spicy Malay fare before dipping into the iconic pool for a delightfully refreshing cool down. 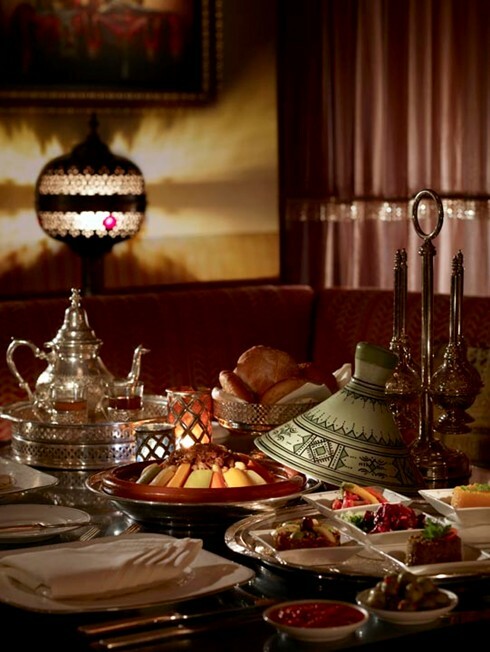 Two culinary high points of Oman may be found at the Al Husn hotel: Sultanah, a stylish restaurant with a luxury cruise theme; and Shahrazad, the only authentic Moroccan restaurant in Muscat, where you can savour traditional Moroccan favourites in a contemporary and refined setting. In addition to these the Capri Court offers a wonderful contemporary Italian experience. 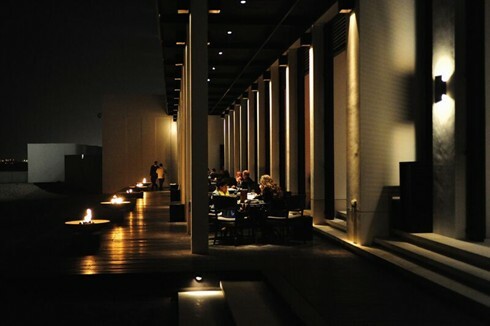 Sultanah offers a stylish à la carte dining experience. Imaginatively presented as the interior of a luxury cruise liner, guests are treated to captivating views of the sea as they dine. Evening menus vary according to the “port of call” on the liner’s itinerary for the night, in addition to an inventive à la carte menu. Explore the exquisite tastes of Morocco, of subtle spices and exotic flavours. The rich fabric and deep colours of Shahrazad’s interiors are reflections of the rich, beautiful land of Morocco. With the alluring fragrance of spice and the rhythms of live Moroccan music welcoming guests, dining at Shahrazad is a culinary and cultural adventure. In 2005, Chef Mohammed Ettaib joined Shangri-La’s Barr al Jissah Resort & Spa with his wife Rachida, who assists him in preparing real Moroccan cuisine. He had previously been at the Tagine, at the Royal Mirage, Dubai where his exceptional culinary achievements included winning the Best Moroccan Restaurant award in the UAE. Capri Court offers a contemporary Italian experience through an innovative menu and stylish restaurant design. Enjoy its fashionable ambience indoors or relax in the outdoor seating area which looks directly out to resplendent beach and garden views. Capri Court’s menu focuses on the freshness and flavour of the ingredients. New dishes are constantly introduced to highlight seasonal produce. Lauded as one of the top Asian restaurants in the region, genuine Chinese cuisine is served in the heart of Oman. The kitchen team has been specially recruited to guarantee authenticity in the food preparation and the right mix of flavours. Specialising in locally caught seafood and in a tranquil and romantic setting this is another of the Al Bustan’s gems. Executive Sous Chef Mariano Liuzza joined the culinary team at Al Bustan Palace, A Ritz-Carlton Hotel from The Ritz-Carton, Jakarta where he was chef de cuisine at the Italian restaurant. The Italian-German chef worked at Michelin-star restaurant and hotels around the world including Jakarta, Doha, and Germany. 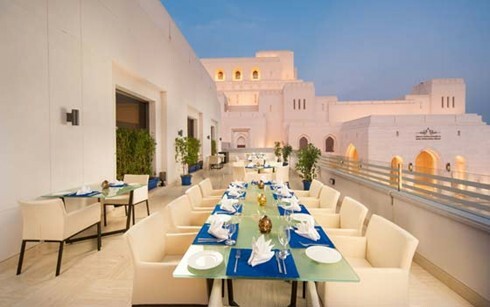 This fine dining Omani restaurant is one of two excellent restaurants attached to the main compound of the Royal Opera House. Al Angham does not allow walk-ins and you must book in advance if you would like to dine at this restaurant. The seating area of Al Angham is breath taking. The ceilings, wood work and everything else is just as elegant and intricate as the inside of the Royal Opera House itself. 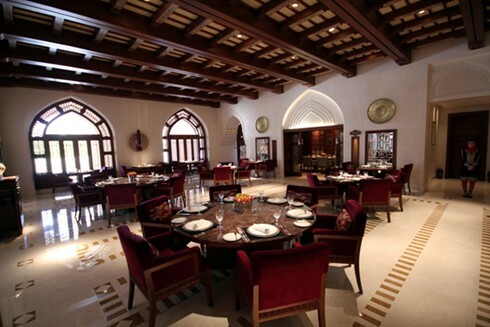 The menu of Al Angham is Omani food presented in a modern setting, using traditional recipes. The service at Al Angham is impeccable and all the waiters are Omani and extremely professional and friendly. The Indus brings the romance of the North West Frontier to life. The vibrant, art-inspired ambience is designed to entice the senses and the spices-laden aroma is reminiscent of the rustic cuisine and exotic flavours of the Indian subcontinent that are expertly recreated by their Master Chef. 'The Indus' signature entrée boasts a variety of succulent meat and vegan kebabs, made from authentic ingredients, using traditional preparations. The main course features a medley of spicy curries, innovative tandoor-cooked breads and special accompaniments. The fascinating interiors of The Indus are a rich blend of the traditional and the modern; laden with artefacts, wall hangings and rich Indian fabrics. The walls are hung with glimmering Kashmiri Jamawar shawls and the Zari-adorned silk cushions burst with colour. 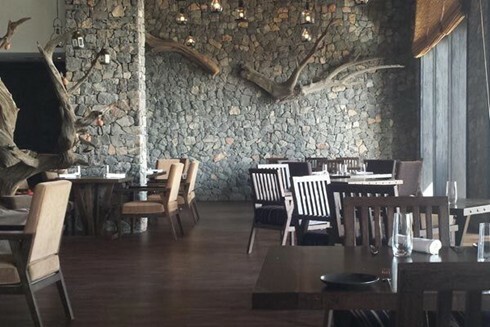 The Juniper Restaurant is named after the juniper trees that grow in the highlands of Oman. As you feast your eyes on the mountain horizon, you can savour an international menu inspired by the golden age of Arabic cuisine and influenced by trade routes that stretched from the Middle East to the Mediterranean. The hotel’s culinary team presents you with a rich variety of flavours using fresh and seasonal local produce crafted to gastronomic perfection, from breakfast to dinner.